If its predecessor was the wearable that showed that Fitbit had the chops to make it in the smartwatch market, this is the one that you’ll actually probably want to buy. Fitbit’s first smartwatch, the Fitbit Ionic, was Fitbit at its most unapologetically Fitbit. Though a massive improvement on the Blaze, it was a little expensive and boasted a sportish look that wasn’t necessarily for everyone - even if fitness tracking experience was as rock-solid as these things come. By contrast, the company’s second smartwatch, the Fitbit Versa, feels a lot more accessible. It’s got a slimmer, slicker design (that an unsuspecting passersby could easily mistake for that of an Apple Watch), the same strong-core software experience found in the Ionic and much-more affordable price-point. If its predecessor was the wearable that showed that Fitbit had the chops to make it in the smartwatch market, this is the one that you’ll actually probably want to buy. At least, assuming you’re already sold on buying a smartwatch to begin with. The Fitbit Versa looks a lot like the Apple Watch in the same way that Oppo’s smartphone’s look like iPhones. There are a few differences - but they’re definitely aiming for that same “friendly technology” effect. The good news is that the move to a slimmer form-factor after the bulkier Ionic and bulkiest Blaze pays off nicely here. The Versa feels super light on your arm and the range of available watch-bands serve to cover most of the major bases. At launch, there are a good variety of silicon, leather, metal and fabric watch bands on offer. Like its predecessor, the Versa comes IP67 rated against water damage and boasts a comparable 4 days of battery life. However, it does lose out on one layer of protection in the form of Gorilla Glass 2 - which the Ionic had and the Versa lacks. This isn’t the only exclusion separating the two. Aside from the price, the biggest difference here is the absence of built-in GPS connectivity. Unlike the Ionic, when you go for a run or workout, you don’t get full-blown route tracking and the device calculates your distance using heart-rate data. It’s by no means a deal-breaker but it was something I noticed and kinda missed after extensively using the Ionic in recent months. Thankfully, if you keep your phone on you while you run, the Versa will pull GPS from your handset in order to pick up the slack. Still, for the most part, the Versa comes off as slimmer and slicker looking compared to the Ionic as the Ionic was to the bulkier Fitbit Blaze. It’s actually quite difficult to imagine where Fitbit will look to shave off the form-factor in the future iterations. The fact that you have to use a proprietary “cradle” charger still irks me, but at this point, that caveat is present across almost all the major smartwatches out there - so it’s hard to be too mad about it. In terms of performance, the Fitbit Versa feels a lot more responsive and intuitive to navigate than its predecessor was. At least, at launch. These gains are likely most attributable to the recent FitbitOS 2.0 update, which shifted a number of UI elements and just generally cleaned up the software experience on both the Ionic and its successor. As with the Ionic, there are three physical buttons that compliment an otherwise-largely touch-based interface. Swipe down and you’ll be pulled into Fitbit’s Today app and see a snapshot of your health metrics. Swipe up and you’ll be able to see any recent notifications from your phone or tablet. Fitbit say that a future update will bring Quick Replies to Android users. Finally, swipe right and you’ll be pulled into your library of available apps. This is where the limitations of the Fitbit OS start to emerge. Back when the Ionic released, things seemed pretty promising for the burgeoning ecosystem. Unfortunately, more than six months later, things seem to have somewhat stalled. There are lots of apps that duplicate or compliment the functionality of the Versa but relatively few that meaningfully add to it. When the Ionic launched, Fitbit talked up apps for checking train times and tracking flights but these don’t seem to have materialized either. The company’s experimental “Labs” apps do present some neat possibilities but it’s telling that the big addition here is an app for the music streaming service Deezer. Now, I’m not saying that Deezer shouldn’t be available on the Fitbit Versa. However, with music streaming services being the dominant way that most people listen to music nowadays, the lack of massively-popular global platforms Spotify, Apple Music or Google Music really stings here. It's worth noting that there are likely some very specific and legitimate reasons why some of those platforms aren't currently available on the Versa yet but their absence is felt all the same. Again, and as with the Ionic, you have to drag music over manually using the Fitbit’s desktop app - which remains an often clunky, inelegant and finicky process. Listening to music over Bluetooth using the Versa is great - but the road you have to take to get there is an annoyingly convoluted one. This issues aside, the core apps that come preloaded on the Versa are almost all really good. Fitbit’s contactless Pay service casts a pretty wide net for support (though, unfortunately, not one that covers my own credit card). Nevertheless, this ended up being a feature I got a lot more use out of on the Ionic than I expected to - so it’s nice to see it here. Outside of that, and the Versa’s baseline fitness tracking tech, there’s not a huge amount available app-wise. There’s an app that lets you check the weather and one that lets you set alarms. There’s an app for controlling Philips HUE lights, a working-if-clunky version of 2048 and an app that lets you view your Google Calendar appointments. If that library of functionality sounds limited, that’s because it is. Things are further hampered by the fact that apps developed for the Ionic will have to be updated in order to support the slightly-different screen size on the Versa. Fitbit have also talked up a set of new female health tracking features, due to come to both the Versa and the Ionic via software update. For obvious reasons, these aren’t necessarily features that I’d get a whole lot of use out of - but they are worth touching on. When it launches, users will able to log their menstrual cycle data and record symptoms using the Fitbit app. Eventually, Fitbit say that a proprietary cycle algorithm will learn from this data and allow you users to see the timing and overall shape of their menstrual cycle at a glance. It’s worth noting that there are already apps available on Android and iOS that offer a similar level of functionality but it’s neat to see it included as a baseline here. Ultimately, though, whether or not these app limitations should affect your decision to buy-in on the Versa is going to depend on what you’re looking for. If your primary motivation is fitness, then the Versa is a great - and maybe one of the best - options out there. Don’t let these next couple of paragraphs dissuade you. In fact, if you're primarily in it for the health-tracking, you're probably best to just stop reading right here. 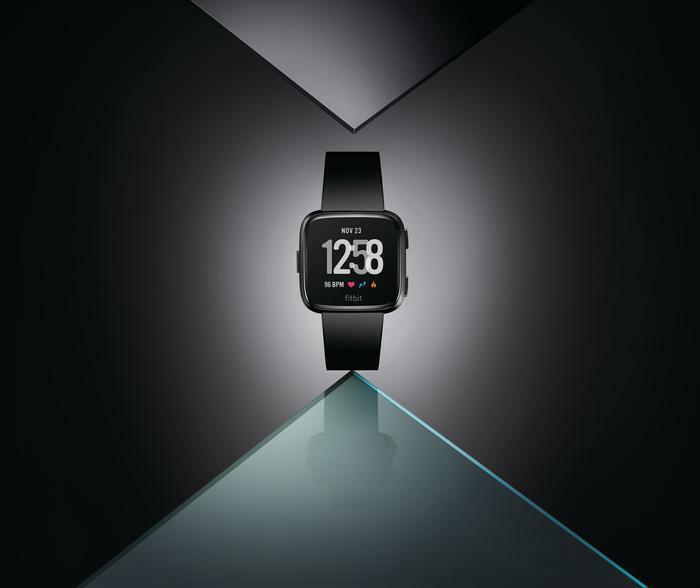 Because if you’re the kind of early adopter whose excited by the new possibilities and avenues of connectivity that smartwatches can offer then, maybe, the Fitbit Versa might not be smartwatch you’re looking for. It looks good, it feels right, it has solid battery life and sits at a compelling price-point. However, for better or worse, it feels like the Versa is almost-exclusively good at the same things that the Ionic was good at - and a lot of those things have been things that Fitbit has been good at for a while now. It succeeds handily at being a “smartwatch for the rest of us” but it does so by staying firmly within its lane. Still, as a product, the Versa is easily one of the best pieces of hardware that Fitbit have ever put out - even if it is overly satisfied with settling for a comfortable sort-of greatness than it is the kind that pushes the category forward as a whole. It feels like Fitbit are looking to lodge a personal best here rather than a world record.